PHOENIX (AP) — Joe Ingles has the green light to fire away from 3-point range — and he did so effectively Wednesday night. Ingles lifted a short-handed Utah Jazz team with 27 points, tying a career high, and knocked down six 3s in a 118-97 win over the Phoenix Suns. Donovan Mitchell led the way with 29 points for the playoff-bound Jazz. Phoenix lost star guard Devin Booker for the game with 4:28 left in the first quarter when he landed awkwardly on his left ankle while jumping to receive a pass. Booker suffered what was announced as a sprain and finished with eight points. Suns coach Igor Kokoskov said results of an MRI on Thursday will reveal the severity of the injury. Ingles scored 15 of his points in the second quarter, and Rudy Gobert had 17 points, 13 rebounds and five blocked shots for the Jazz, who remained in fifth place in the Western Conference and have won 11 of 12. 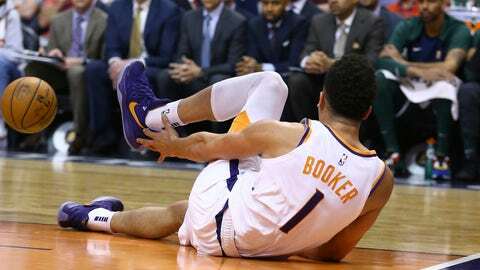 Booker’s injury left the Suns without five of their top players, as center Deandre Ayton, guard Tyler Johnson and forwards Kelly Oubre Jr. and T.J. Warren are all injured and did not play. Richaun Holmes’ 16 points and nine rebounds led the Suns, who have lost seven of eight. Rookie Elie Okobo added 15 points. “That’s even more reason you want to just get back up and stay out and fight with your guys as much as possible,” Holmes said of playing with fewer able bodies. The Jazz played without several top players, including point guard Ricky Rubio, who sat out with right hamstring tightness. Rubio missed his first game of the season and was replaced in the starting lineup by Royce O’Neale. Utah also was without forward Jae Crowder (bruised right quadriceps), forward-center Derrick Favors (back spasms) and guard Kyle Korver (right knee soreness). The Suns built a 13-point lead in the first quarter, but faltered after Booker went down. The Jazz rallied and tied the game at 33 with 9:38 left in the second quarter on Grayson Allen’s corner 3-pointer. Utah took its first lead, 40-39, on three free throws by Mitchell midway through the second quarter. Ingles hit back-to-back 3s for an eight-point Jazz lead, and knocked down all four of his 3s in the second quarter. Raul Neto’s 3 at the 3:09 mark of the third quarter gave the Jazz an 82-72 lead. The Suns got it to 99-94 midway through the fourth quarter, but a pair of free throws by Gobert and Mitchell’s fourth 3 of the game put Utah up by 10 with 4:41 to play. “Joe and Donovan hit some big shots that were timely,” Jazz coach Quin Snyder said. “When you’ve got everybody on the same page, it’s easy to make those big pushes,” Mitchell added. Jazz: Utah won all four games against Phoenix this season and has won seven straight overall. … Allen’s 14 points were a career high for the rookie from Duke. … The Jazz made 57.1 percent of their shots for the game. Suns: F Mikal Bridges received the Dan Majerle Hustle Award before the game. The award is presented at the end of each season to the Suns player deemed to have shown the same hustle and spirit that the Suns Ring of Honor member displayed as a player. … G Jimmer Fredette got the loudest cheers from fans after Booker’s departure. Fredette was a hit with Jazz fans when the Suns played at Utah on March 25, and with plenty of Jazz fans in the Suns’ building Wednesday, heard it for each of his five baskets. … F Josh Jackson was issued a technical foul in the third quarter. Jazz: Host Sacramento Kings on Friday night. Suns: Host New Orleans Pelicans on Friday night.